I have often wondered what our ancestors fed their dogs in terms of natural home made dog food so I decided to do some research on this subject. Here is what I discovered….apparently, commercial dog food was not created until the late 1850s in Britain. Dog kibble began as dog biscuits made with wheat, beet root, some vegetables and Beef blood. In 1908, the first commercial puppy food was created for retail, made by a biscuit company (The F.H. Bennett Biscuit Company). The Bennett company was bought out by another biscuit company (Nabisco) in 1931 and produced a biscuit known as Milk bone dog biscuits. In 1922 Chappel Brothers of Rockford, Illinois, introduced Ken-L-Ration, the first canned dog food processed from horse meat. By 1941, canned dog food had a 90% share of the market until the US entered ww. The US government rationed tin and meat around that time so the dog food market veered back into dry dog food in the form of biscuits. In 1950, the Ralston Purina company, who was making a dry cereal for people (Chex) branched out into creating dry dog food using the same technology and Purina Dog food was born. By 1964, commercial dog food was big business. The Pet Food Institute, a lobbying group for the now-gigantic pet food industry began a campaign to convince people to use dog food but not for the love of the dog. To this very day, this very same Institute, lobbies against homemade diets for dogs.There is a lot of corruption within the dog food business, for information on Dog food recalls and more details on dog food ingredients, check out the website www.truthaboutpetfood.com. Make sure you type in the .com because apparently The Pet Food Institute owns the domains with the same name but with .net and .org. Coincidence? I don’t think so. What did Grandma feed her dogs? So what did our Grandparents and Great Grandparents feed their dogs (if they weren’t feeding a commercial dog food)?? The diets were varied.. home made dog food ingredients would have contained bread and milk, porridge made with oatmeal, barley, wheat etc. along raw meat scraps and table leftovers. Milk was raw, not pasteurized, and was easy to digest due to raw milk containing all the enzymes intact. Eggs were given too, if a farmer had excess. There were many sources that people used, to feed their dogs. Bones and other scraps from the butchers, hearts, livers, lungs, feet, necks etc. Dogs living with the upper class obviously enjoyed a much better diet than those from poor families who didn’t have much to spare. Most dogs throughout the centuries have had meager diets that they were forced to supplement by hunting or scrounging through garbage heaps. Dogs today, have a luxurious way of life, compared to what we know about their ancestors in the history pages. And yet…are our dogs healthy? My Grandmother had a favorite dog that lived to age 22, she fed him like people did back then…scraps, porridge, bread and milk. However, she and her family were reasonably well off compared to others in the village. They raised their own chickens, beef, pork, milk and always had a huge garden in addition to crops in the field. I would imagine her dog ate well too, better than most. Dog foods have come a long long way in terms of quality from 1850. My dogs eat a kibble dog food that contains quality cuts of either chicken or lamb, rice and a large variety of veggies and fruits. I have also used fish based dog foods with certain dogs as well. 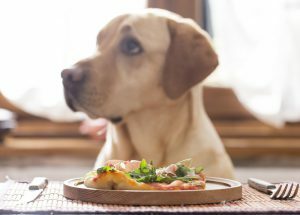 Homemade cooked and raw diets have made a resurgence since the infamous pet food recalls in 2007 when melamine in pet foods was poisoning pets. Many pet owners no longer trust the pet food industry, for good reason. Trust the dogfood companies? Switch to raw dog foods or homemade cooked dog foods?… it gets very confusing sometimes. I have chosen to trust certain dog food kibble brands and have not been disappointed so far. I also supplement with raw eggs from my own organic raised chickens and also add Kefir to their food often for probiotics. I use plain Kefir, with no added sugar or flavours added. My dogs love it and I also drink it plain on a regular basis. I really don’t have any great desire to cook for my dogs full time as I already cook 3 meals per day for my husband and myself every day. My dogs often get leftovers from the fridge that we don’t want. I would consider trying the raw dog food with my dogs, as least partly. There are so many books on cooking for your dog, recipes on line everywhere you look that if you were to choose the homemade dog food route, there is a lot of help out there. Regardless of what feeding method you choose, it is very important to ensure that the diet has enough calcium and equal amounts of phosphorous. Diets that are low in calcium/phosphorous , cause abnormal bone growth in the dogs, too much and too little both cause skeletal problems. Soft bones that dogs can consume provide plenty of calcium but are lower in phosphorous, meat contains higher amounts of phosphorous but is low in calcium. Both are important. Eggs and fish are perfectly balanced so therefore excellent choices for home cooked dog food recipes. Fruits, vegetables and grains are all great sources of phosphorous too, so it makes sense to me when feeding a high bone content diet, to include at least 25% of the diet in fruits and vegetables. Legumes and seeds are also great sources. 3 cups of diced vegetables — Some great choices include cabbage, carrots, peas, green beans and kale. Use at least two vegetables or all the choices. Set a pot of water to boil, then add the cut up fish, vegetables, cook until vegetables are barely tender. Drain water, and now add the eggs. The heat from the freshly cooked fish and veggies, will cook the eggs now too. Lastly add the cooked rice (or cooked quinoa, oatmeal, lentils), stir up well. Let sit until cool. Remember how I mentioned that fish and eggs are perfectly balanced? 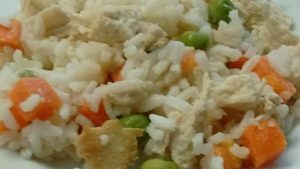 While this recipe calls for water to be drained because you are using cooked rice or the other substitute after the fish and veggies are cooked…. if you have a slow cooker this recipe becomes even easier and more nutritious! To convert this to a slow cooker recipe, ALL the ingredients would go in, uncooked, except for the eggs. For every 1 cup of uncooked rice, you would have to put in 1 3/4 cups of water. The fish and veggies will add some moisture. Mix all ingredients and switch on the cooker. If you find the end product is too wet or too dry, adjust accordingly for your next batch. Cook on high setting for 3-4 hours. You will have to experiment with this to see how fast or slow your slow cooker does the the job. It depends on the size of your slow cooker too and how full you have it. When your grains are tender, it is done, (turn off the cooker) now quickly mix in the raw eggs. They will cook quickly in the hot mix. Allow to cool. 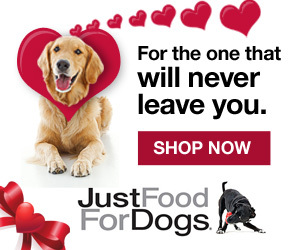 Feed what you need to, to your dog (put leftovers in the fridge) or freeze the whole amount into meal size servings. For extra nutrition, after it cools, I would add extra fat from Flax oil for the healthy Omega 3 oils (2 Tablespoons). No other oils like Olive Oil, Canola or Corn, they do not have the benefits that Flax oil has. Fish and Flax oils also provide pain relief for dogs with arthritis by relieving the inflammation. Krill oil is an especially powerful noninflammatory supplement, I use it twice per day for myself with excellent results. There are probably thousands of recipes, but keep it simple. I did some research online for books that might be helpful. Here is one I found on Ebay called Chow, (click on it) as it looked interesting and fun. The dog meal recipes contained in this book are meant to be shared with YOU! The author Rick Woodward has a wonderful sense of humour too. Making your own dog biscuits is equally simple. 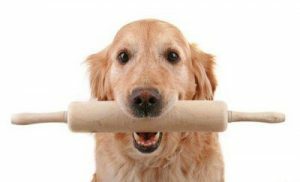 Stay tuned… I will be experimenting with some gluten free Dog biscuits and will post some free recipes in my new Posts. In the meantime, I have a collection of Pinterest recipes that you might find interesting. Until next time….